The Fast and the Furious: Super Bikes is the second game inspired by the hit movie franchise. This time, the action is not confined to the United States. Super Bikes takes players from Sturgis to Monaco, from Chicago to Shanghai, and from Detroit to Switzerland. 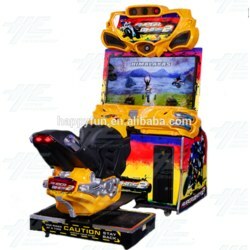 Players can choose from 12 licensed motorcycles and riders. Like The Fast and the Furious, players can upgrade their bikes with NOS, bigger engines, tires and more! Discover several shortcuts and unveil hidden secrets in these tracks, and learn to master the curves! Gain a huge advantage over your opponents by power-sliding through the curves and be the first to arrive at the Finish Line! Super Bikes takes players from Sturgis to Monaco, from Chicago to Shanghai, and from Detroit to Switzerland. Players can choose from 12 licensed motorcycles and riders. Like The Fast and the Furious, players can upgrade their bikes with NOS, bigger engines, tires and more! Discover several shortcuts and unveil hidden secrets in these tracks, and learn to master the curves! Gain a huge advantage over your opponents by power-sliding through the curves and be the first to arrive at the Finish Line!